The 30th birthday wishes here are inspiring, even funny, even if turning 30 isn't (for most, not all people). Take a look below — you'll find only birthday messages for 30 year olds that can brighten their special day. When I turned 30, I suddenly felt "old" (so silly in retrospect). At the time, the only thing that made me feel better about entering "Club 30" was my father's sage advice. What was it? The thirtysomethings will likely be the first peaceful decade of my life, so I should just enjoy the ride. 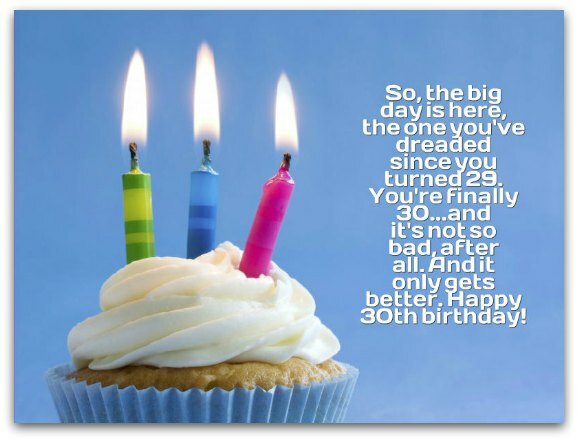 For many newly minted 30 year olds, this type of birthday message may be enough. For others, humor may be a better approach. 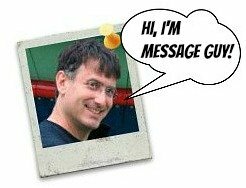 That's your call. Wow, just think, you’ll be 60 in 30 years from now. Actually, don’t think. Just do. Happy 30th birthday! May your 30th birthday be as special as the first day of spring, the first time you heard The Beatles, your first love, the first...In other words, as special as you are. Whoever said it’s your 30th birthday day doesn't know how to count. Here’s how: 1, 2, 3, 4, 5, 6, 7, 8, 9, 10, 11, 12, 13, 14, 15, 16, 17, 18, 19, 20, 21, 22, 23, 24, 25, 26, 27, 28, 29, 29, 29, 29, 29…See! Happy 29th birthday! So, the big day is here, the one you've dreaded since you turned 29. You're finally 30...and it's not so bad, after all. And it only gets better. Happy 30th birthday! Life's a highway and you're not even halfway to your destination at 30. Enjoy the journey and, whenever you can, take some fellow travelers along for the ride. Happy 30th birthday! Party as much as you want on your special day, but don't go too crazy. After all, you're in your 30s now, so you could wake up with a nasty hangover and what tastes like cat litter in your mouth. Happy 30th birthday! So what if you're 30. It’s not like you’re 100. That’s 70 years away. Until then, enjoy every second. Have a wonderful and joyful 30th. Hope your 30s will be as incredibly fun as your 20s...without the hangovers! Happy 30th birthday! It's not lousy turning 30. Be proud of everything you've accomplished in the last three decades and get excited about what you'll achieve in the decades to come. Happy 30th birthday! At 30, the best is yet to come. Really. At 40, it’s a different story. Enjoy your 30-somethings. Happy 30th birthday! You're not 30 years old. You're actually 29, 11 months, 29 days and 24 hours. Happy "29 years, 11 months, 29 days and 24 hours" birthday! When you turn 30, you transform into someone who looks a lot like you but acts a lot more like your parents. Happy 30th birthday! Welcome to the 30+ Club! You have to turn to 40 to get out! In the meantime, enjoy the membership benefits. Happy 30th birthday! Lots of people make jokes about turning 30. But it's not too bad...if you don't mind that 40 is just a hop, skip, jump and pulled muscle away! Happy 30th birthday! When I turned 30, my whole life improved. No joke, everything suddenly got easier. I guess moving out of my Mom and Dad's house at 30 was a good idea. Here's to our independent 30s. Want to find out how to choose the right 30th birthday wishes for your birthday boy or girl? Click here to check out my tips on the previous page. Your 30s are a time for building the bridges that will take you from the poverty of your 20s to the prosperity of your 40s. It's a great decade, full of amazing, fun challenges (if you have the ambition). And I know you do. Happy 30th birthday! You'll do just fine in your 30s. You always land on your feet, no matter what you do. Here's to a happy and healthy decade! Happy 30th birthday! It's almost unnecessary to wish you a happy 30th birthday. You're such a happy-go-lucky person already. So here's to an incredibly happy 30th birthday!